Their eyes will light up when they see this colorful display! A vibrant burst of Lilies, Roses, Gerbera Daisies, and Irises in shades of stunning red, bright blue, sunny orange, and cheerful yellow with hints of pale pink are set against stunning glossy green banana leaves. 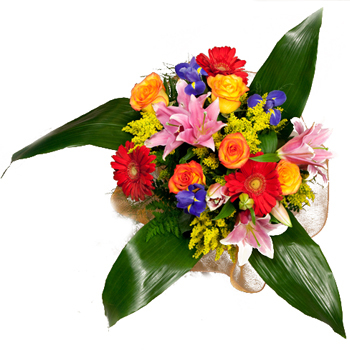 Whether you're celebrating a birthday, showing your appreciation on Secretary's Day, saying I Love You, or hoping they'll Get Well Soon, any recipient will be happy to receive the Floral Fiesta Bouquet.